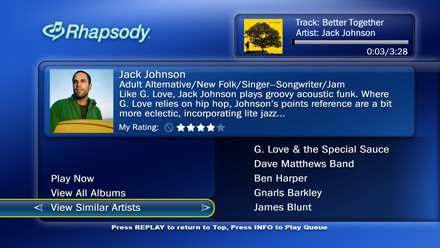 TiVo continues to add web services to its line of broadband-connected DVRs, with today’s announcement that the Rhapsody music service can now be accessed through the company’s set-top-box. The new feature announced Tuesday means TiVo subscribers with broadband-connected set-top boxes will be able to listen to music streamed over the Internet from Rhapsody’s service. The service, now part of Rhapsody America, a new joint venture between RealNetworks Inc. and Viacom Inc.’s MTV Networks, has a catalog of more than 4 million songs. In an attempt to distinguish TiVo from more generic DVR offerings, the addition of Rhapsody joins other integrated web services including Amazon’s television and movie download service, UnBox; Yahoo! Photos, Weather, and Traffic; movie booking service, Fandango; and the Internet radio network, Live365.